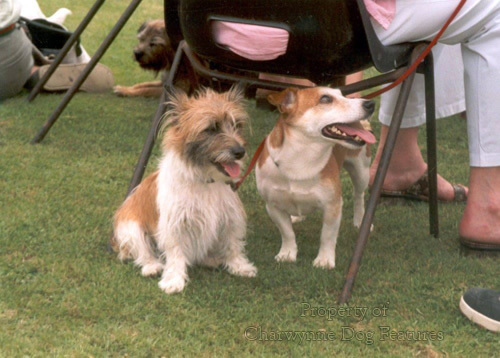 If you consult the lengthy, detailed and quite precise word-pictures of each terrier breed set out in the Kennel Club's Breed Standards, you could be forgiven for not knowing that nearly every sporting terrier breed was once, and for many still should be, a canine digging machine. I can understand why say the Airedale, the Bedlington, the Bull Terrier, the Soft-coated Wheaten or the Kerry Terriers are not exactly built as earth-dogs, but for the others, is the 'digging foot' not at all important? 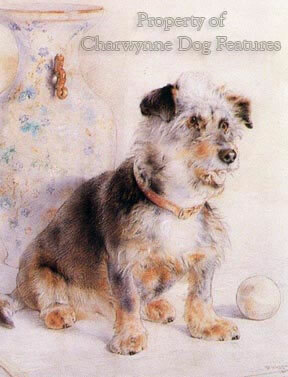 The Australian Terrier's feet have to be "small, well padded, toes closely knit and moderately arched, turned neither out nor in..." This dog, developed from terrier stock already created and recognized, was clearly modelled on the terrier standards around the time it was first recognized as a breed. The Fox Terrier is expected to have 'small round and compact feet, turning neither out nor in.' 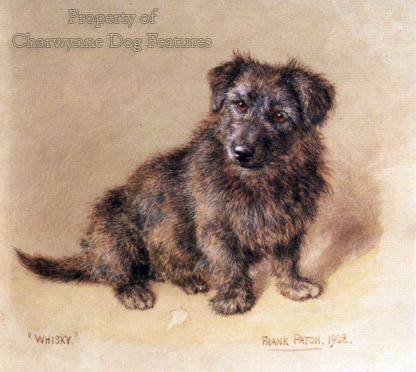 The Parson Russell Terrier has similar requirements. Most breeds stress the need for straightness in the fore-limbs. Are these the best stipulations for a little digging machine? In his informative The Book of All Terriers, Howell Book House, New York, 1971, John Marvin makes a key point for judges when examining the terrier’s feet: “…a long-legged Terrier, when digging, throws the earth under his body and through his spread back legs. The short-legged breeds are different. Because of their low station, these breeds cannot throw earth under their bodies…Rather, they throw the earth sideways so that the low-slung body may pass through. 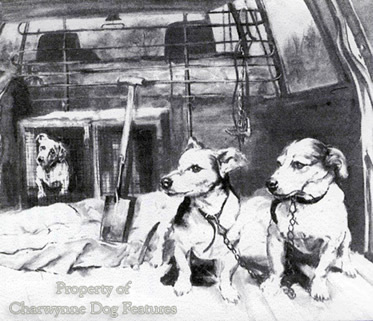 In order to accomplish this it is necessary that the feet turn out slightly to guide the earth sideways of the body…Actually, feet pointing straight ahead on a short-legged breed are not correct and should be faulted although most judges do not look with disfavor on feet pointing straight ahead.” Sporting terriers, whether short or longer-legged were designed to dig! They must always be judged as terriers. The Sealyham, despite its low station, is expected to have feet pointing directly forward; does this help them as earth-dogs? The Skye has to have feet pointing 'truly forward' - why? The Westie has to have its forefeet, or digging feet, larger than its hind ones, as does its cousin the Scottie. 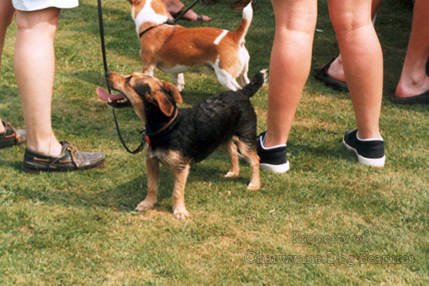 Small breeds from similar stock and with identical roles, like the Norwich and Norfolk are expected to have different feet! The latter has to have feet that are just round with thick pads, the former ones that are rounded, well-padded and cat-like - pointing straight forward standing and moving. Where does the disturbed earth go when this breed is digging? The Glen of Imaal, thankfully, has to have its front feet turned out slightly from the pasterns. If John Marvin is correct, then surely the longer-legged terriers should have straight legs and the short-legged ones feet that are turned out. Or doesn't a field capability not matter in breeds of dog specifically designed to dig after vermin? Smartness of appearance seems to be the only criterion in the show ring, yet fitness for function is the slogan of the day! The appearance of a dog's feet has more to do with exercise than Breed Standards. Dogs with soundly-constructed feet will still develop splay feet and slack pasterns if exercised on pastureland that is lush and soft. Road work is essential and is usually recommended to 'tighten up' the feet, but rough cinder tracks are probably best. Shape of foot can usually be linked to function. I see working lurchers with long hare-feet and show Greyhounds with cat-like feet and toes compactly bunched. But both those descriptions are flawed. How many dog owners have seen the underside of a hare's foot? Cat-like originally meant like the round compact feet of the cat family, rather than like the ginger tom next door. Why not use the expression 'wolf-like'? It is important to keep in mind too the original purpose of the breed when considering feet, especially when purpose can vary between digging efficiently and running fast. Galloping breeds like the sighthounds have great freedom of the upper arm and elbows which are separated from the chest wall. The Greyhound's weight falls mainly on the toe-pads. The German Shepherd Dog's weight falls on to the heel-pad of the forefoot. The Greyhound is therefore usually seen more 'up on the feet' comparatively in its stance. The earth-dogs feet have value more in size and angle to the leg.